Genre: Racing. Other versions: PC. Was TOCA 2 the last great British game to be made for the Great British gamer? Codemasters seized masterfully on a brief moment in time when the BTCC, with its riotous collision-packed racing, had become a bigger talking-point over a pint than Formula One, which was itself struggling against a perceived culture of conservatism brought about by the lack of overtaking and introduction of ugly, safety-first grooved tyres. And when Visual Sciences dropped the ball spectacularly with Formula 1 98, TOCA 2 was on hand to take the chequered flag in its stead. The idea of a game with such a narrow cultural reach being granted a full retail release nowadays is almost unthinkable. But it carries with it a fittingly British appeal; a succession of fabulous circuits set in unpretentious, modest to the point of stark countryside locations; cultured, no-nonsense handling and a hard-as-nails campaign that only the most dedicated, skilled and patient will ever have the pleasure of besting. TOCA 2’s handling remains as challenging to master as any racer there has ever been. Turn just a little too sharply and the car will pitch into a leery slide and, nine times out of ten, result in a punishing trip through the gravel. Brake too late, you’ll miss your apex. Brake too hard, and the front tyres will lock. Brake or turn on an uneven bump, or get tagged from behind by aggressive A.I. and an equally ugly fate awaits. What’s wonderful though is that it teaches you there’s an art not only to a good lap, but also a good race. Smoothness, good lines and a tailored car setup will net you a fast time, but it also demands true race-craft; knowing when to attack, when to hold station and the need for nerveless commitment when overtaking are all a prerequisite. You’ll be tasked with maintaining a level of concentration so unerring, Gran Turismo will seem like a Sunday drive by comparison. In terms of pack racing, it’s one of the best of its kind, featuring some of the most robust (read: insane) competitors you’re ever likely to come across in a racer. They’re fast and entirely willing to engage in a bit of argy-bargy, even amongst themselves. I have seen instances of cars tussling up the road, one being pushed on to the grass and crashing quite vigorously as a result. Not like I minded, as I gained a place as a result. But this kind of occurrence adds to the feeling that a real race is taking place around you. Opposition cars are as tough as they come, and smashing into the back of them in a braking zone no longer results in them straight-lining a corner as it did in the original. The most danger lies at the start of a race, as extra vigilance must be taken with everyone charging ferociously into the opening few corners, thus you have to commit to them with an almost do-or-die attitude to ensure that you avoid contact. It’s not for the faint of heart. The devil is in the detail, as they say, and TOCA 2 is replete with high-end touches. The in-car view sees your driver changing gear by hand, or gesticulating angrily if (sorry, when) you get bashed by a competitor, and the shoulder buttons allow a sideways glance out of the windows. The damage characteristics are absolutely stunning by PSone standards: windscreens smash, impacts jar and prang the body work, and sometimes even cause the bonnet to spring up, obscuring the view for a brief, scary moment. Little touches set it apart; the DualShock vibration, for instance, rattles along gently at speed, and then offers a heavier sensation upon riding the curbs. The cars are resplendent in their distinctive, clear liveries and the realistic engine notes alter depending on whether you play from an external or in-car view. Add to this rain, fog and changeable weather effects and you're left with a tremendous challenge. The icing on the cake is the Championship mode; eighteen rounds of racing split into twos, each race meeting consisting of a sprint and a longer, feature race requiring a mandatory pit-stop. Failure to accrue at least 15 points per meeting means you'll have to retry the pair. Admittedly, this can feel a little harsh, especially as progression can be baulked at a stage when you've already mathematically won the title, but then you'll discover pretty quickly that it gives you nothing for free. There are a couple of small foibles; namely a bit of pop-up and some wildly inconsistent qualifying times on the part of the A.I., but what ultimately prevents TOCA 2 from achieving a maximum score is, purely and simply, a poor frame-rate. Whilst qualifying feels rapid enough, there are times when the races get a little too hectic for the PSone, and lag is particularly noticeable on the grid. It's a shame, as it can be detrimental to cornering judgement (not helpful in a game that already demands such standards) and the ride isn't as smooth as Gran Turismo or Rage Racer, though its A.I. is considerably less robotic. Still, there's a hoard of excellent features to keep the gamer engaged long-term. 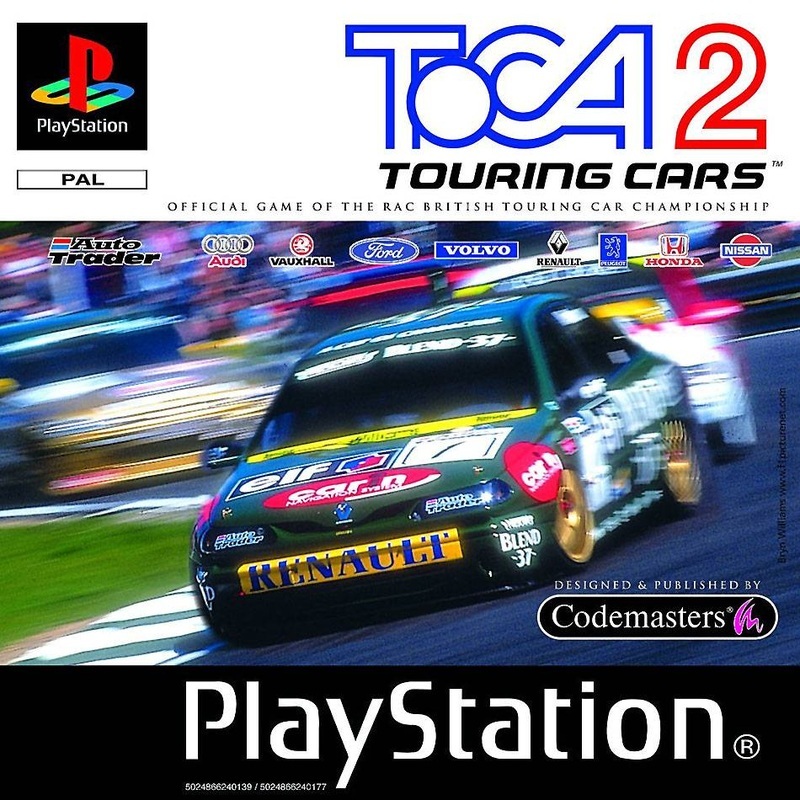 A full two-player championship complete with a big field of drivers provides an awesome and rare treat for PlayStation gamers (a feature oddly omitted from its follow-up TOCA World Touring Cars). Elsewhere, there's an expansive support-car setup consisting of short race tournaments and featuring everything from hatchbacks to single-seaters, making for a nice, gentle introduction to the trickier courses. There's also a plethora of bonus courses to unlock. These include the bonkers Downtown USA with its mall short-cut and Loch Ranoch, replete with countryside undulations and, along with a few of the other courses, some rather respectable off-roading, perhaps an instance of the developers testing the water for Colin McRae Rally 2.0. PlayStation gamers weren't exactly hard-up for great racers at the time, but TOCA 2 offered it's own unique brand of quality racing. Whilst Gran Turismo presented gamers with a 'real driving simulation', TOCA 2 was offering them a real racing one. Tough as a brick and decidedly Anglo-centric, newer gamers are unlike to afford it the same degree of patience it was given in the nineties, but there are few fifth-gen racers that offer such a deep, involving and satisfying gameplay experience.